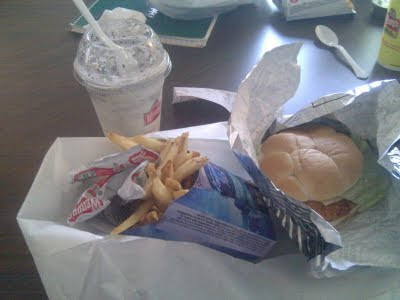 Wendy's! Lunch! Fun! The perfect combo of the schmancy Asiago Ranch Spicy Chicken Club (sans the bacon - come on, got to keep it healthy...), the new Natural Cut French Fries (whatever the hell that means) and an Oreo Twisted Frosty, yo! And, no, I do not want to know the nutritional information.